There’s an Isaac Bashevis Singer collection for Hanukkah called The Power of Light, which my family owned when I was little. 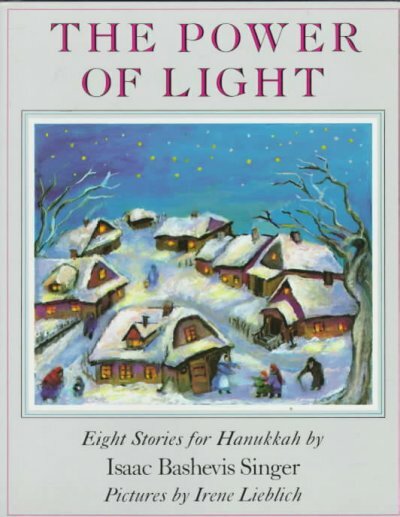 It’s a collection of eight stories for Hanukkah. My favorite was probably the title story, about two Jewish teenagers trapped in the rubble of the Warsaw Ghetto after the uprising. Probably the best-known story in there is “A Parakeet Named Dreidel,” in which a parakeet shows up on the windowsill of the narrator’s New York City apartment. I looked this up, tonight, thinking about this, because I was curious about the historical context. The boys were called cantonists, and this system (which included some schooling) was originally started out as something for the orphaned sons of soldiers. The kidnapping and forced conscription was something done to Roma and Polish boys as well as Jews. The news coming out of Russia, about journalist Masha Gessen’s fears for her family, and the very real threats from the Russian government against LGBT families — the threat that they are going to take away the children of loving parents because the parents are gay –this has all reminded me intensely of this story. Anyway. I don’t really have a particular point here, other than that people should read Isaac Bashevis Singer (you can also find that story in his Stories for Children collection, although The Power of Light has absolutely stunning, gorgeous illustrations in it), boycott Russian vodka, and support asylum for any GLBTQ Russians who ask for it.